On Wilson Mills Road, just West of I-271 in Highland Heights, is a restaurant geared specifically toward burger lovers, and beer lovers! 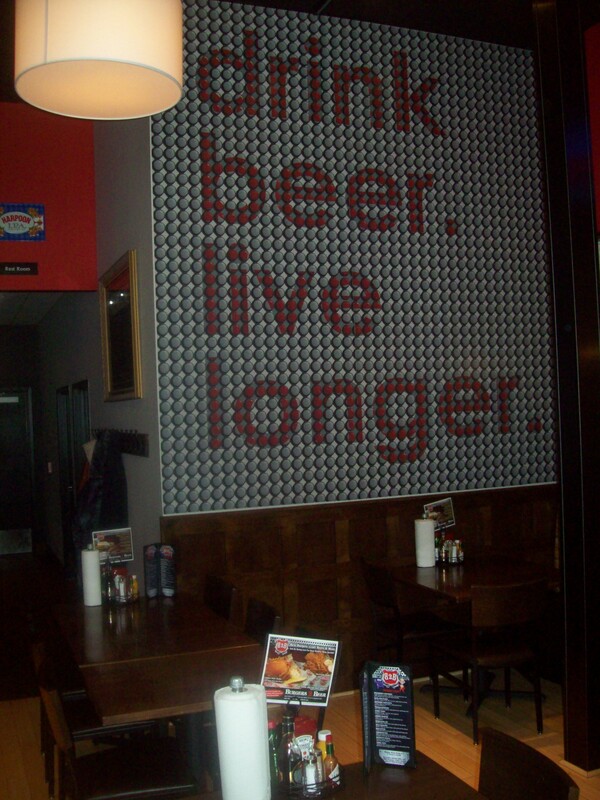 The independently owned Burgers 2 Beer opened their doors in 2011, and business has been good. So good, that if you go on a Friday, Saturday, or a Burger Night, ($5 burgers on Mondays from 5 to 11), you may have up to a half hour or more wait just to get a table… and then another half an hour after you order to get your food! And yet, it doesn’t deter the burger faithful. Every weekend the scene reenacts itself – month after month. So, what is it that keeps packing ’em in? That’s what we’re rolling into town to investigate! From their website we learn that Burgers 2 Beer sets itself apart from the average burger joint offering a large burger menu with a “diverse and interesting combination of flavors.” We’re going to confirm that; the menu is impressive! The food is locally sustainable and procured, and the beef is 100% Ohio raised and grass-fed. They pride themselves on the “uniqueness” of their venue. Located in a strip plaza, there is plenty of free parking. The interior has a very fresh, contemporary style to it. A large custom chalkboard, with a beer list, covers an entire wall, (now it’s getting interesting)! The menu sports close to 80 different brews from all over the world. Prices range from $2.25 for the domestics staples like Budweiser, Miller Lite and others, to the more exotic, high end beers such as Sierra Nevada – Ovila, ($15). And they also offer several dozen other labels not on the menu, including a selection of ice cold draft beers. But, we’re not here for the beer! Well,… maybe that’s not entirely true, but, that is enough babbling about the beer. Let’s talk BURGERS! That tells you they’re taking their burgers seriously! They offer 17 different burgers, some conventional and others with some very interesting toppings. The prices range from $7.99 for the “Simple Susan,” to $9.99. They also offer a Bison Burger for $13.99. One of the more interesting burgers the menu offers is also one of their best sellers — B2B’s version of the “Luther” burger — a honey peppered bacon, sharp American cheeseburger… on a glazed donut! (The story goes, singer-songwriter and record producer Luther Vandross is the inventor of the concept.) There’s also a “Burger of the Month” that doesn’t appear on the menu. When we were there, it was “The Peeper Butter Burger.” What’s that, you ask? Well, you know those cute, yellow, marshmallow peep candies we all get in our Easter baskets? Yep, they melt nicely. Oh, and don’t forget the peanut butter. All burgers come with a nice portion of fresh-cut fries, and a side of coleslaw, and that’s where we’ll begin our appraisal. We all enjoyed the coleslaw with our burger and agreed that it’s a nice extra that you don’t get everywhere. The seasoned, fresh cut fries were crisp, which is something else you don’t get everywhere — we’ve seen plenty of limp fries! The toasted bun was fresh and did it’s job ’til the very end. No one will ever describe it as an amazing or incredible bun. But, a good, fresh bun it was. The organic beef was deliciously seasoned and cooked to order on every plate. It received very high marks on each of our score cards. Three of us ordered different burgers that all came with the honey-peppered bacon. We all noted that the bacon was thoroughly cooked and deliciously enhanced the flavor of the burger. Those of us that had lettuce and tomato noted that the lettuce was fresh and crisp, “good burger lettuce.” The tomato? Well… out-of-season tomatoes are what they are. I think you know what I mean. Overall, we give Burgers 2 Beer a unanimous thumbs up!